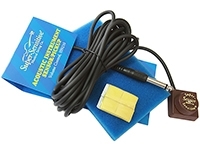 The Super - Sensitive® Sensor / Pickup amplifies sound for all types of acoustical instruments. It utilizes a piezo transducer that delivers full sound to amplifiers for faithful reproduction. Easily affixes and removes from instruments with a non-marring, reusable adhesive.